Paul Stott will be presenting his latest findings on the impact of the Panama Canal extension at the Low Carbon Shipping Conference at Newcastle University today (Wed 12 September 2012). There are lots of gems in Paul Stott’s latest analysis of the New Panama Canal “New Panamax and its Implications for Ship Design and Efficiency” (2012 Paul Stott, School of Marine Science and Technology, Newcastle University), but the one I like the most is the use of AIS data to determine the “actual” operating draft of Post-Panamax Containerships. I have been a fan of using ship movements since my days on Lloyd’s Shipping Economist, but this is a particular clever use of the data. But I am jumping ahead. 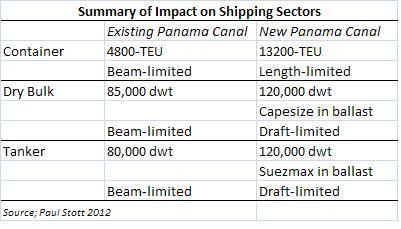 The paper examines the impact of the expansion of the Panama Canal on ship design and efficiency. The impact on trade is important, but difficult to quantify. For instance, Paul points out that only 2.5% of world seaborne trade passes through the canal, but around 25% of the commercial fleet has a Panamax beam. Indeed, a Panamax broker at Clarksons once told me only about a third of the ships he fixed had ever transited the Canal. Under the old dimensions the constraints on commercial ships centered on the beam. By making the dimensions longer and fatter, potentially a heavier combination of ship and cargo can enter the dock system. Then the constraint becomes the ship bottoming out on the floor of the dock. Looking at Containerships first, Paul finds that the Panama Canal Authority (PCA), may have under-estimated the new maximum permissible size. The PCA estimates the maximum size will increase from around 4800-TEU (limited by beam) to 12000-TEU. However, typical of a the large Containership with a length of 366m and beam less than 49m is the 13100-TEU “MAERSK EDISON”. In ship registers the “MAERSK EDISON” is listed as having a scantling draft of 15.5m, which is too deep for the expanded Panama Canal. But the operating draft is not as low, and using AIS data an analysis of similar vessels revealed the mean draft was 12.6m and the median 12.9m, well inside the constraints of the new Panama Canal. As 50% of the PCA revenue comes from Containership transits, this potential increase in maximum size will be very welcome news for the PCA. On the dry bulk side, the draft limitation also arises (or should that be “falls”). Paul finds the length and beam accommodates most 180,000 dwt Capesize, but these would be too deep in the water when laden. They will, however, be able to transit in ballast. The largest laden dry bulk carrier will be around 120,000 dwt. As Paul points out, this does not necessarily mean the “Mini-Cape” will become the new Panamax, as a lot depends on the cargo lot size preferred by charterers and receivers. But ship size tends to creep upward, so it seems likely this will be the new Panamax standard. New Handysize / Supramax and 85,000-dwt designs will benefit from the increase in Panama Canal beam, as designers will be able to optimize hull designs without the beam constraints. On the tanker side, a Suezmax will fit in the new locks, but not fully loaded. Like the Capesize, these will be able to transit in ballast or part laded. The largest standard tanker that can past through fully laden will be the Aframax of around 120,000 dwt. As in the dry bulk sector, there is room to optimize hull designs of the small sectors, and this might benefit the Product Tanker sector. The paper goes on to suggest areas of further study, and I have included the paper below. A shipping analyst whose feels the need to comment on the industry. But expects that volumes have now bottomed out after two years of exiting "certain low margin business activities in Asia." Will the Kobe Steel Scandal Dent Japanese Ship Values? Rio Tinto Mine Operating Driverless Trucks, Drills and Trains – What Next?